Your blog essentially is a website. Like all websites if you are looking to earn money with it you need to increase your traffic. One way you can do this is through search engine optimization. Before you begin optimizing your blog for the search engines you need to ask yourself what types of visitors do you want to target? If your target audience is parents for example, what are some popular topics that parents search for on Google? The terms that you come up with will be your key words. Write down all these key words because they will be important. The sub domain of that post would look something like this: https://healthymomsmagazine.net/2009/05/PottyTrainingTips If your blog is hosted on Blogger long titles will be shortened so be sure to place your keyword at the beginning of your title. Now you are ready to optimize your blogs post or what I like to refer to as your article. 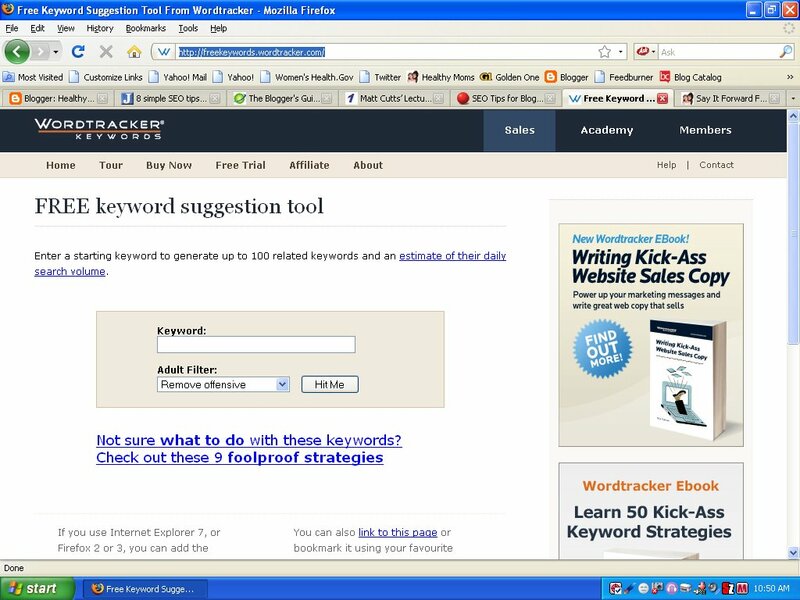 I like to use this handy free key word tool from Word Tracker. This tool will help you to determine what your secondary key words will be. First type in your primary keyword, that is the keyword that is in the title of your article, then click hit me. Here is a list of keywords that are related to the term potty training. Next to that keyword you will find how many times a month (on average) that term is searched. It looks like potty training boys is second on the list. Next we will visit Google and do a search on our own. We want our article to appear on the front page of Google. When we type in “potty training boys” in Google we come up with 211,000 results. Anything below 300,000 is pretty good. That means that you don’t have as much competition. If the other terms that came up in word tracker are relevant to your article you can go ahead and repeat the process with those words. Okay so now you optimized your articles for the search engines but when you search for those terms yourself your blog still doesn’t appear on the front page of Google. Now what? You need to get high quality back links to your site. What the heck are back links? Back links are simply one way links to your website. This will also improve your Technorati ranking. Then you need to contact these bloggers and become their friend. One way to do this is sending them a note saying that you enjoy reading their blog and your blog is very similar so you were wondering if they could add your blog to their blog roll. You could also request a link exchange or if you are really looking to increase your traffic offer to write an article for the other blogger to publish on his or her blog. Make sure when you send the e mail to the other blogger you compliment them on their blog and mention that you are a reader. Blogging is all about building relationships. Make sure you are updating your blog frequently. Blogs that are updated a couple times a week or less are often left behind by the search engines. You should make sure you are publishing a new article at least once a day. If you know that you are going to be busy next Thursday if your blog is hosted by Blogger you can schedule an article to run on that day. Make certain that you keep your original domain. Sometimes bloggers change platforms. The two most popular being Blogger and WordPress. If you decide to do this do your research to find out what you need to do to keep your domain before switching. This will ensure that you keep your original readers and subscribers. I hope these tips help you to increase your blog’s traffic and earnings. Happy blogging! Thank you for this! I'm planning on working on my blog over my Christmas break so this couldn't have come at a better time.